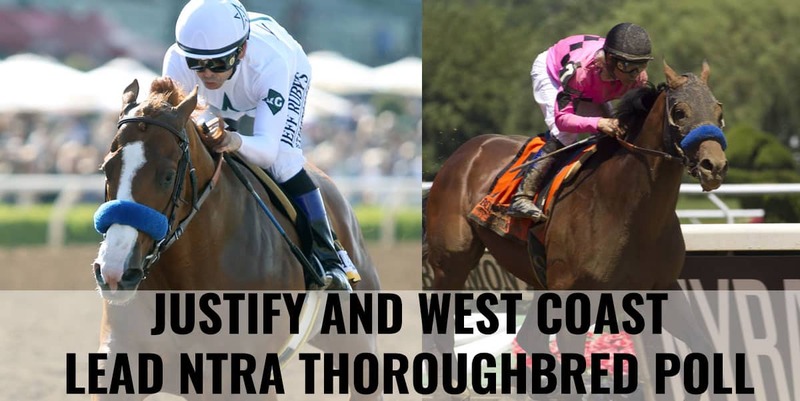 Undefeated Justify has taken over the top spot in the latest NTRA Top 3-Year-Old Poll and will likely be favored in the May 4 Kentucky Derby Presented by Woodford Reserve after winning Saturday’s $1 million Santa Anita Derby (G1) by three lengths over Bolt d’Oro, who had topped the NTRA Top-3-Year-Old Poll for its first 10 weeks. The lightly raced Justify – trained by Bob Baffert and ridden by Mike Smith for owners China Horse Club International, Head of Plains Partners, Starlight Racing & WinStar Farm – earned 21 first-place votes (out of 46) and 424 points overall in the poll, results of which were released today by the National Thoroughbred Racing Association (NTRA). Audible (6 first-place votes; 358 points) held onto the second spot on the basis of his April 2 Florida Derby score. Last year’s Champion 2-Year-Old Good Magic (4; 335) reestablished his elite form by winning the Grade 2 Blue Grass at Keeneland and jumped in the poll accordingly, moving to third. Bolt d’Oro (1; 324) dropped to fourth as a result of his first loss this year. He was, however, 6 1/2-lengths clear of the Santa Anita Derby third-place finisher. Mendelssohn (12; 290), the 18 1/2-length winner of the $2 million UAE Derby, garnered 12 first-place votes but dropped one spot overall. The winner of last year’s Breeders’ Cup Juvenile Turf (G1), based in Ireland, has not started in the U.S. in 2018 but has been eligible for the poll since he was known to be targeting the Kentucky Derby. Three Kentucky Derby contenders from the Todd Pletcher barn are next in the poll: Magnum Moon (214), sixth, set to run Saturday in the Arkansas Derby (G1); Noble Indy (136), seventh, winner of the March 24 Louisiana Derby (G2); and Vino Rosso (131), eighth, winner of Saturday’s Wood Memorial (G2) at Aqueduct. Pletcher, who also trains Audible, is poised to start four in the Derby. Enticed (77), second in the Wood despite being bothered by the winner in midstretch, held steady in the ninth spot. McKinzie (71) continued to drop down the rankings as news spread that he is out of Derby consideration and unlikely to make the Preakness. In the NTRA Top Thoroughbred Poll for horses of all ages, Army Mule emerged as a force to be reckoned with at middle distances, winning the seven-furlong Grade 1 Carter Handicap by 6 1/4 lengths in his stakes debut. The 4-year-old colt cracked the Top Thoroughbred Poll at seventh and will likely run next in the Metropolitan Handicap (G1), more commonly known as the “Met Mile,” on Belmont Stakes Day. The rest of the top 10 remained similar to last week, with $10 million Dubai World Cup runner-up West Coast the clear leader and Eclipse Award-winning Champion Female Sprinter Unique Bella in second. Unique Bella is expected to run Friday in the Grade 1 Apple Blossom at Oaklawn. The full results for both weekly NTRA Thoroughbred polls can be found on the NTRA website at: http://ntra.kinsta.com/ntra-top-thoroughbred-poll-april-9-2018. Full accounting of top 10 votes, by voter: http://ntra.kinsta.com/wp-content/uploads/Polls-week11-by_voter-2018.pdf.